Jacqueline Scott seemed to have every reason to live. 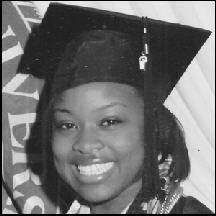 She was beautiful, brilliant, young and among the brightest graduate students at Ohio State University. She taught an undergraduate class. One of her students said she "was definitely a happy lady." Scott, 24, went to a shooting range and shot herself in the chest last month after learning how to use a handgun at a shooting range in suburban Columbus, Ohio. One of her colleagues in graduate school said she was "despondent" in the days before her suicide and seemed to be disinterested in her graduate studies classes. Only Scott knows what troubled her and led her to take her own life. But Scott's death cleary underscores the need for more awareness and discussion of depression and mental health issues among black women and less shame and silence. Suicide is a top leading cause of death for young black women age 14 to 19 and among the Top 10 causes of death for black women ages 20 to 24 and also for the 25 to 34 age group, according to the Centers for Disease Control and Prevention. The stereotype of the strong, dependable, do-it-all-alone, hold-the-family-together, nerves-of-steel black woman needs to disappear. It is time for black women to shed the Superwoman facade, cape, tights and the "S" on their chests and ask for help and receive it. But that is hard because black women occupy so many roles in their personal and professional lives. The burden of carrying so many responsibilities and people can cause a woman's back to crack. The stress of working jobs they desperately need where their humanity is assaulted by people who devalue and disrespect them slowly erodes their confidence. Terrie Williams, a veteran celebrity public relations specialist, said it best in the title of her book about her own battle with depression, Black Pain: It Just Looks Like We're Not Hurting. Taking the time to address mental health and troublesome feelings is critical, especially now as we strive to survive the economic crisis. We lose too much when we don't. There is the lost time, opportunities and relationships. And the illnesses that escalate and create even more problems. Most importantly, we lose phenomenal and talented women like Scott and my musical and artistic idol singer and actress Phyllis Hyman who killed herself in 1995. Talking to friends, family, clergy and counselors is a must to battle the blues and the fallout that comes with it. Therapy is not a "white folks thing" and asking for help isn't a sign of weakness. Just as black women visit doctors for physical health there is no shame in seeing specialists to attend to mental health. It's time for suffering in silence to end. Destigmatizing mental health and creating a culture of support is needed to save lives. We can't afford to have black women to continue to bury their feelings or have more families bury the troubled and beloved women in their lives. If you need to talk to someone about your feelings call the National Suicide Prevention Lifeline at 1-800-273-TALK.